Rick Meyer never got his call to the majors. Years later, a much different call almost got him killed. Years after his playing days were over, in May 2014, Meyer was working as a local sheriff's deputy in Indiana. He responded to a call of suspicious activity on a bridge and encountered two men. He arrested one. The other seemingly fled, according to WLKY.com. As Meyer waited for backup, the man who fled returned. Without warning, he opened fire, Meyer recalled weeks later WLKY. "I felt an impact, but it didn't hurt," Meyer told the station. "There was no pain. I wasn't even sure if I was hit. If it was my vest or it was my body until I ran away and I felt some blood dripping down my chest. He hit me again and I felt blood." Meyer survived. He also returned fire, hitting his 18-year-old assailant. With the arrival of his backup, the shooter was in custody. It was an incident a world away from where Meyer once worked professionally, on a baseball field. Meyer played in that world over four seasons, never making AA. He entered that world at the age of 19, not much older than the man who would later try to kill him. 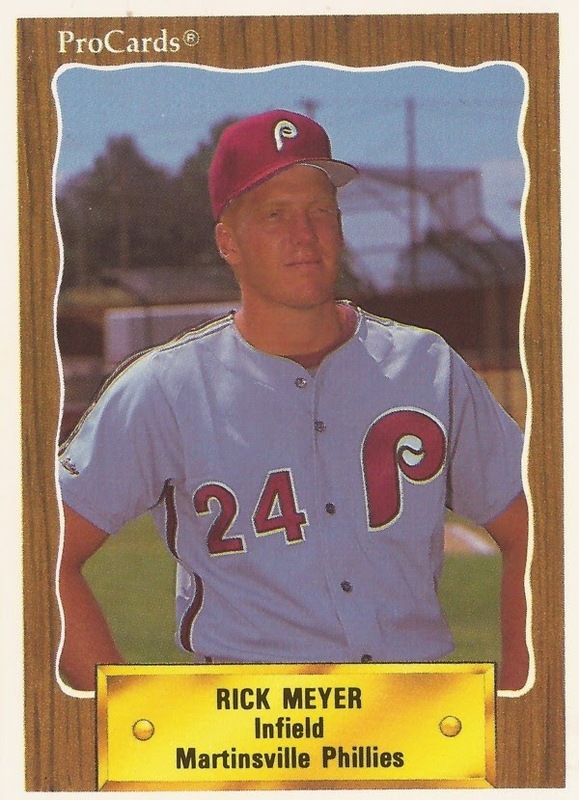 Meyer's career in baseball began in 1989, signed by the Phillies as an undrafted free agent out of Seymour High School in Seymour, Ind. He played his first two seasons at rookie Martinsville. He hit .233 his first season and .242 his second. In 1991, he moved to single-A Spartanburg. He had four hits in a June game and knocked in two runs in a July game on a single. Overall, he hit .241 in 80 games. That September Meyer got to play in Philadelphia, in a "Youngtimers" game. He had three hits in that game. His final professional season came in 1992 at high-A Clearwater. He hit .219 in 98 games, ending his playing career. After working different jobs, Meyer eventually started his new career in 2007, joining the Jackson County Sheriff's Department, according to The Seymour Tribune. The Tribune also noted his past in the Phillies organization and that Meyer and his wife have three children. Then came May 2014 and his encounter with that 18-year-old at the bridge in Tampico. Meyer attributed his response to his training, according to The Tribune. "When we have training, especially firearms training, it's serious," he told The Tribune. "It's not a joke. We know we're not wasting our time there." In September 2014, Meyer received the Distinguished Service Award for his "actions and courage" from the local county commissioners, according to The Tribune.